Altinkum boat trips are a great way to see some of the fabulous coves and bays that would never been discovered by many people. There are literally many of beautiful beaches scattered along the coast of Agean Sea. You can weigh anchor and spend hours swimming or snorkeling in the clear blue waters. The waters around this beautiful bays paradise stay warm enough for swimming right through to April due to the heat the water stores up during the hot summer months. There are all kinds of Yacht and Boat trips that sail out of the little Altinkum harbors and fishing shelters dotted all along the coast. Whether your preference is for diving fishing or just a nice relaxing pleasure boat there is a trip thats just right for you. The fishing trips are many and varied from the chartering of a small private motor launch right up to the most professional and modern vessels that will take large fishing parties right out into deep water you might just need to hire or find the right one near Altinkum Harbour. Altinkum Didim and Akbuk fishermans will be based near harbour and you cant miss it if you need some fresh fish, Akbuk is very well knowing for fishing. Be sure to book yourself a Altinkum boat trip that visit Akbuk during booking and you will see some real green paradise with clear sea and natural beaches. You could end up eating pasta, chicken shish kebab or meetballs for your lunch on the boat and bbq is just amazing with cold drinks. 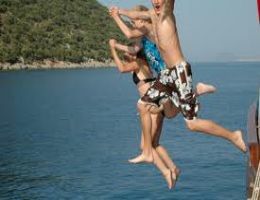 For most holiday makers the ideal Altinkum boat trips are the ones that offers all day drinks and lunch plan because under hot sunshines you will need to keep yourself cool, sometimes swimming not enough to keep cool under sun. There are plenty of other price plans to select but we would highly advice that you choice allday drinks options if you can. All day drink options from boat trip and they are not expensive either. Some of the biggest pleasure cruises sail out of the lovely harbor at Akbuk which is situated left side of the Altinkum on the map and our favorite destination on the boat trip visit along with Aqua Bay. If you are feeling a little more adventurous there are some Altinkum boat trips with a difference including a fabulous dance shows, musics, belly dancers and banana rides which also sails from Altinkum to third beach where Altinkum Yacht Marina is build, which is fully open now.. If you want to experience some boat trip then this is probably the one for you in Altinkum holidays, just relax with Lazy Day Daily Boat Tours. 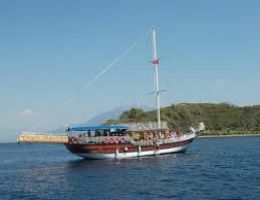 Whatever you decide your holiday would not be complete without taking one of the many Altinkum Akbuk boat trips. With so much to see around the small bay Aegean coast there is no better way to take it all in. You will enjoy lazy day boat tours, thats what has been called for many years by the way and very well knowing by the locals. Remember to take your snorkel because the warm clear waters are teeming with a huge variety of marine life. Dont worry though because there has never been any reported shark sightings off the coast of Altinkum Didim or Akbuk areas.